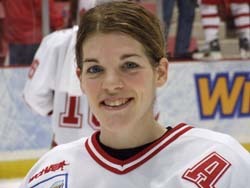 The NCAA Champion Wisconsin Badger women&apos;s hockey team stole the show when it came to members on the all tournament team. The Badgers beat Minnesota-Duluth 4-1 to win their 2nd straight Frozen Four title in Lake Placid, New York. Sophomore goalie Jessie Vetter was voted to the first team after allowing just 1-goal in the two Badger wins. She&apos;s joined on the all-tournament team by Badger teammates Meaghan Mikkelson, Bobbi-Jo Slusar, Jinelle Zaugg and Sara Bauer (pictured). Bauer was named the tournaments Most Outstanding Player.